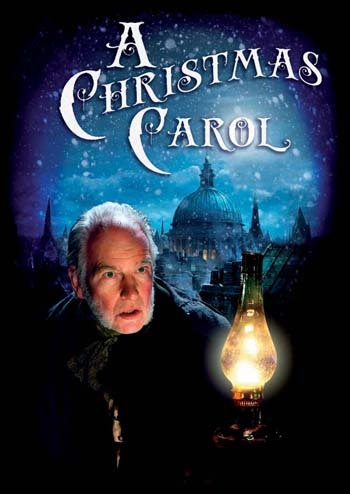 An ambitious project: to bring Charles Dickens’s rambling, episodic novel (originally a serial) to the stage. But it has been done magnificently with regard to Nicholas Nickleby, so why not give it a go? Unfortunately, The Pickwick Papers lacks the scale and the scope of that other book and, most crucially, it lacks drama. So, what we get with Nicola Boyce’s adaptation is a series of scenes of little consequence involving characters that veer towards caricature. Ian Dickens (some relation?) directs a cast of faces familiar from his other productions and pretty much gives them an easy ride. Rebecca Wheatley gives a star turn as Mrs Leo Hunter performing a poem set to music about an ‘expiring frog’ – this characterisation contrasts effectively with her other role as the shy Miss Wardle. 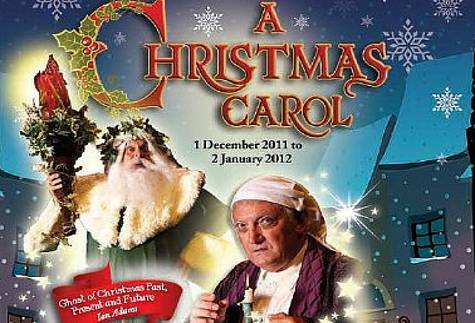 David Callister is enjoyable as conman Jingle, inhabiting the costume and the vernacular with ease. Poppy Meadows is underused – very funny as Mrs Bardell. Dean Gaffney is well within his comfort zone as affable manservant Sam Weller – a pity he doesn’t get to flex the comedic muscle we saw earlier this year in Murder in Play. Daniel Robinson and Scott Grey are the effeminate, giggling, shrieking ninnies Mr Winkle and Mr Snodgrass – they get the best scene in terms of action when poor Winkle finds himself embroiled in a duel thanks to the misconduct of Callister’s Jingle. On the whole, the cast is very good and looks good in the costumes. I think part of the problem is the set. Most of the action takes place on a rostrum but this is set so far upstage it adds further distance between the actors and the audience beyond that provided by the fourth wall. It is very difficult for them to engage with us and us with them, being so far removed from each other – my seat was fifth row centre and I felt like I needed binoculars. Often the stage is crowded with people with their backs to us, further shutting us out. A disembodied voice narrates passages to cover scene changes, keeping us at a distance yet again rather than addressing us directly. Also, the running time is not borne out by the content. The story, such as it is, is too flimsy to sustain interest for almost three hours. I found my mind wandering, unable to focus on some of the verbiage – Pickwick, nicely played by John D Collins – is a garrulous old thing but the script is in need of editing. What should be a delightful, diverting way to pass an evening, becomes something of an endurance test. It’s like trying to have a five-course meal in a sweet-shop: delightful at first but ultimately unsatisfying and lacking in nutrients. Writer Hugh Janes has adapted ghost stories by Charles Dickens, resulting in a play that has a good deal in common with long-running West End hit, The Woman in Black. 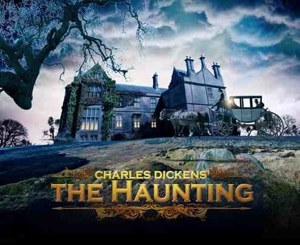 A young man is despatched to an isolated mansion for bureaucratic reasons and is disturbed by supernatural phenomena… Unlike its predecessor, The Haunting is more straightforward in its structure and approach and, thanks to Simon Scullion’s impressive, Victorian gothic set, has a more naturalistic feel. The atmosphere is perfect with mists and cobwebs and decay. Doors open and slam of their own accord. Books fly from shelves. There are plenty of ‘jump’ moments to rouse the audience and crank up the tension. David Robb is splendid as the urbane, sardonic Lord Gray, a sceptic who is trying to sell off his late father’s estate, including his library of valuable books. There is a fey humour to his dismissals of the paranormal and he looks suitably dashing in a range of frockcoats and dressing gowns. I didn’t take to his young counterpart in the same way. As the credulous book dealer, James Roache is togged up like Daniel Radcliffe in the film of The Woman in Black, but his delivery of most of his dialogue is off-putting; he attacks his lines like a barrister making courtroom revelations. Where the play is let down is in some of the dialogue. At times they speak in descriptions, giving voice to passages from the Dickens original (“the house, pinched on all sides by the moor”) or spout the most florid lines (“I consider literature the buttress of pedantry”) that it is a good job the set and props are there to interrupt them before it all becomes too wordy and dense. Director Hugh Wooldridge handles the atmosphere splendidly. All the old tricks in the book of old tricks are here. Drawn-out silences suddenly shattered by loud noises. Mists and shadows and things moving about. Disembodied voices and ghostly apparitions… And it all works very well. The mystery of the ghost story is gradually unravelled, and is not without surprises. On the whole, this is an exercise in demonstrating the pleasure we take in being wound up and scared. It’s an intriguing little story, well-executed and presented. Special mention must go to Jonathan Suffolk’s sound design, which plays such an important role in putting us on edge. Well worth the trip, the production gives you that unique frisson of hundreds of people all being startled at once, and then gasping and laughing at what silly creatures we all are. You don’t get the same experience at the cinema. “It wasn’t what I expected,” said one woman as the audience filed out at the end. No, me neither. I found my expectations surpassed by Jo Clifford’s adaptation of Charles Dickens’s novel about social climbing. It begins, not with the famous scene in the graveyard, but with the grown-up version of protagonist Pip (Paul Nivison) entering the rather grandiose set: the interior of a grand mansion, gone to rack and ruin. At its centre is a wedding cake. Pip is revisiting the place where his change of fortunes began. Implored by Estella (Grace Rowe) he summons up memories of his youth, conjuring up characters from his past. They appear through the walls, from behind picture frames and so on, their faces ghostly white, grotesque and exaggerated, distorted by the prism of memory. And so, in Miss Havisham’s living room, the whole story is re-enacted. Adult Pip narrates a bit, but mostly stands by and watches. 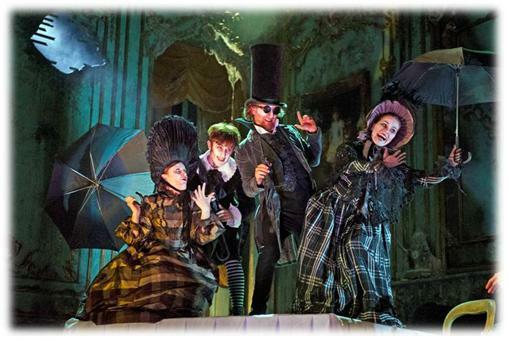 Young Pip (Taylor Jay-Davies in an engaging performance) suffers cruelty at the hands of his sister (a deliciously monstrous Isabelle Joss in a characterisation that would be at home in a Roald Dahl) and has his emotions toyed with by the haughty Estella. I needn’t summarise the plot, I feel, because the book is so well-known, and of course any adaptation will truncate or omit some events and characters. This one is a delightfully gothic affair. A lot of money has been lavished on the decaying grandeur of Robin People’s magnificent set and the striking, almost circus-like costumes by Annie Gosney and Graham McLaren. Mr Wopsle sports a top hat that adds almost another yard to his height. The soldiers who recapture escaped convict Magwitch wear expressionless masks, dehumanising them. There is more than a little of the Tim Burton to the aesthetic. Nathan Guy struts and poses on the mantelpiece as Herbert Pocket, a colourful mixture of the Joker and the Penguin by way of the Mad Hatter. Everyone in Pip’s past is bedecked with cobwebs. The action and atmosphere are supported by an eerie, almost horror-movie score by Simon Slater. The dazzling designs are more than matched by the quality of the performances. Jack Ellis certainly has the moves like Jaggers (sorry) and the marvellous Paula Wilcox is brittle and imperious as celebrate eccentric Miss Havisham, swanning around in her wedding dress. When she re-enacts the moment she heard she was jilted on her wedding day, Wilcox emits a heart-rending cry. This is melodrama but you can’t help being touched and chilled by it. As convict Magwitch, Christopher Ellison (off of The Bill) storms it. With thankless dialogue that requires him to swap his Vs for Ws he portrays the wretched warmint wery well, imbuing the character with dignity and pathos. Ellison has never been better. Director Graham McLaren uses the conventions of narrative and emblematic theatre to tell the classic story in a new way, making it fresh without messing about with the plot or the themes. Dickens would be heartened to find we are more civilised these days. We no longer send children (or anyone else) to the gallows. But he would share my dismay that the iniquities of society persist. The arrogance of the materially well-off (but poor in terms of humanity and compassion) is all too visible every time a government minister appears on the telly.